We head into week two with seven contestants left. In week one Heather showed herself to be an extremely competent sewer and Tamara showed interesting flair and creativity. Julie bagged a surprising win last week with her nightgown chosen for best garment of the week. It will be interesting to see how the contestants manage in week two. SPOILER ALERT! 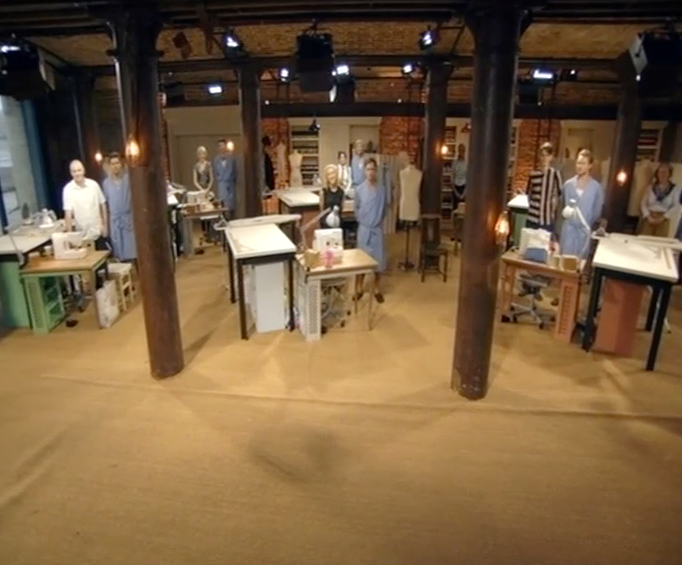 I am going to discuss, in detail, what happens in week two of The Great British Sewing Bee. If you haven't had a chance to watch this episode yet, you might like to sneak off and do that before you read this summary, but please stop by again after you have caught up. Sew a skirt (techniques include box pleats, hand picked zip in side seam, pattern running perfectly across the skirt) in 3 hours. 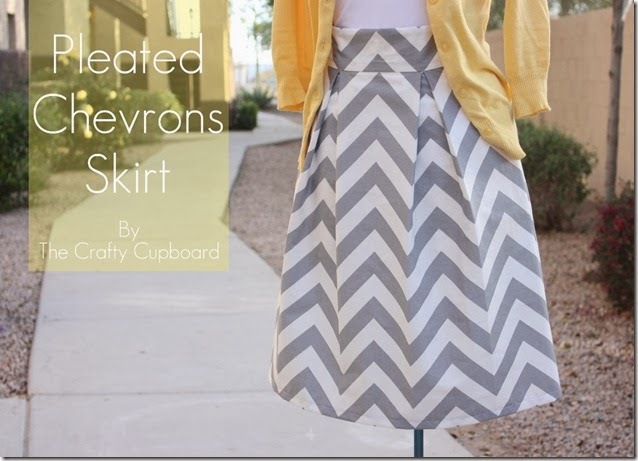 The skirt pattern chosen was very similar to the skirt pictured above, by The Crafty Cupboard. There were two box pleats in the front and the back of the pattern. There was a lapped zip in the side seam, which needed to be sewn in using a hand stitching technique, and most importantly, the pattern needed to run perfectly across the front of the pleats, around from the front to back panels, and through the waistband. Tamara chose a lovely sky blue and white floral print, Julie chose a cute orange and yellow elephant print, and Jenni chose a great orange and pink geometric print. Fabric choice was really important in this challenge. If the fabric pattern chosen didn't match the size of the pleats on the sewing pattern (I'm going to say pattern far too many times in this recap), then the pleats needed to be adjusted, which would mean the width of the whole sewing pattern would need to be adjusted to maintain overall fit. Matching up the fabric pattern through box pleats, and adjusting the sewing pattern proved to be a difficult challenge. Heather seemed the most confident about sewing box pleats. Chinelo found her fabric pattern very difficult to match, and 45 minutes into the challenge nearly chose a different fabric. Instead she chose to rotate her fabric 90°, which seemed to make things easier. Jenni did a brilliant job matching up her fabric pattern through the pleats. David focussed on getting his fabric pattern perfectly matched in the pleats, but completely forgot to adjust his sewing pattern resulting in a skirt with a tiny waist. Matching the fabric pattern through the waistband proved to be another difficult challenge. Tamara sewed her waistband on backwards, and had to remove it. Simon, Jenni, Chinelo, and Lynda all had waistbands that didn't quite line up perfectly. Once again, Julie ignored elements of the sewing pattern and used an invisible zip, rather than the lapped zip, and hand-sewed her waistband instead of topstitching it. Lynda also added an invisible zip, but ended up unpicking her zip and using the method specified in the sewing pattern. The judges gave their most positive comments on Heather's spot on fabric pattern matching, lovely even zip stitches, Tamara's very well lined up fabric pattern with a difficult fabric choice, David's perfectly matching fabric pattern through the pleats and Cerina's nice zip and good sewing overall. Their most negative comments were on Julie not following the pattern (again), David's sewing pattern not being adjusted and the skirt not fitting, and Simon's pattern matching not being good enough. The results from 10th place are Julie, Simon, Jenni, David, Lynda, Chinelo, Cerina, with Tamara in second, and Heather in first (for the second week in a row. Personally, I'm not sure I could have made a perfect skirt in three hours, and I'm very impressed that so many of the contestants did such a great job. Take two mens shirts in different patterned fabric and turn them into one garment it in 1.5 hours. The contestants were given 50+ shirts to choose from. They could cut them up, and combine them in any way they wished. The judges were looking for a good combination of fabrics, and an interesting design. What they really don't want to see, is a shirt cut down with a band of different fabric added to it. Lynda and Cerina decided to make a child's dress. Heather, Julie and Simon decided to make shirts. Chinelo made a bustier, and Jenni and Tamara made skirts. Some of the fabrics chosen looked really dubious (especially Simon's, David's and Tamara's). Cerina made good use of her fabric and made a very sweet child's sailor style dress. Jenni's skirt was reminiscent of the first challenge, with box pleats in the back, however she made nice use of her fabrics. Chinelo's bustier was simple but cute, with a lovely bow detail. The judges gave their most positive comments on Chinelo's great bustier and beautifully placed bow, Cerina's good choice of fabrics and trim, and May was blown away by Tamara's amazing skirt. Their most negative comments were on Heather and Simon's simple transformations, and David's choice of fabrics. The results from 10th place are Simon, Heather, David, Julie, Jenni, Lynda, Cerina, with Chinelo in second and Tamara in first (for the second week running). Patric summed up Tamara's work in this challenge when he said the original shirt was "probably one of the foulest shirts ever to grace a humans body, and you've transformed it into something that looks, really, very modern and very cool looking." Sew a pair of mens pyjamas in a patterned fabric to fit a real model in 6 hours. There were some interesting fabric choices. Jenni had a gorgeous black and white moustache and pipe print fabric, Cerina had a lovely William Morris blue floral fabric, Heather had a nice, bold red and white stripe, and Lynda had very nice pink, red and blue stripe. Tamara had a crazy newsprint fabric that looks very difficult to match up. A majority of contestants went for a traditional pyjama, with pocket detail, a collar and piping trim. Chinelo went for a very simple short pyjama pattern, with no collar or fly, but aimed to produce a perfectly executed garment, rather than a complicated one. The highlight of this challenge for me was the use of piping in most of the pyjamas. I've only tackled piping in two pairs of shorts, and it isn't something that's easy to do. I can't even wrap my head around how you get the piping perfectly neat around the corners in the collar. The lowlight was Tamara's satin piping trim. Rather than traditional piping, she used a wide border of satin bias tape that just didn't match her fabric. The judges gave their most positive comments on Heather's perfect matching of the stripe pattern, Jenni's very neat piping , Julie's crisp, even collar, Chinelo's perfectly executed work, Lynda's very good piping, pattern matching and great use of fabric stripe running in opposite directions on collar. Their most negative comments were on Tamara's very big piping and fly sewn shut, Simon's collar lapels on even and pocket not lined up, and Heather's button placement wrong and front edges not lining up. The contestants went off for a coffee, while the judges discussed the weekend's work. Simon - he had two weak challenges on day one, but his pyjamas were not terrible. David - his pleated skirt didn't fit, his shirt transformation didn't quite work, but his pyjamas were quite good. Julie - her pleated skirt didn't fit well, her shirt transformation was reasonable, but her pyjamas seemed well received. Garment of the week went to … Lynda for her mens pyjamas. The contestant leaving this week was … Simon. Simon was clearly less experienced than most of the contestants. His work did not have the same polished finish and flair. Having seen the work of the male contestants over the first two weeks, I strongly suspect we are going to see an all female competition before long. Let's hope David can improve his standing next week. Up next week is knit fabrics. Personally I'm very excited by this, as I've recently taken the plunge and started trying to master knits. Hopefully I'll pick up lots of good tips next week. Want to Read More About GBSB? The Thrifty Stitcher - Claire-Louise Hardie is the Sewing Producer for The Great British Sewing Bee. She posts some lovely tutorials on sewing techniques. Little Black Duck - Victoria Peat has posted some great links to tutorials that cover some of the techniques you can use to make your own GBSB inspired pieces. Sew Sensational - Louise posts great links to patterns used in the episode, or similar to those used. The Mighty Mighty Monk Seal - Steve & Chris present a very witty recap, which is written as fans of reality television review, rather than as sewers themselves. If you know any more blogs with interesting recaps or useful advice related to the GBSB, leave me a message and I can include a link. 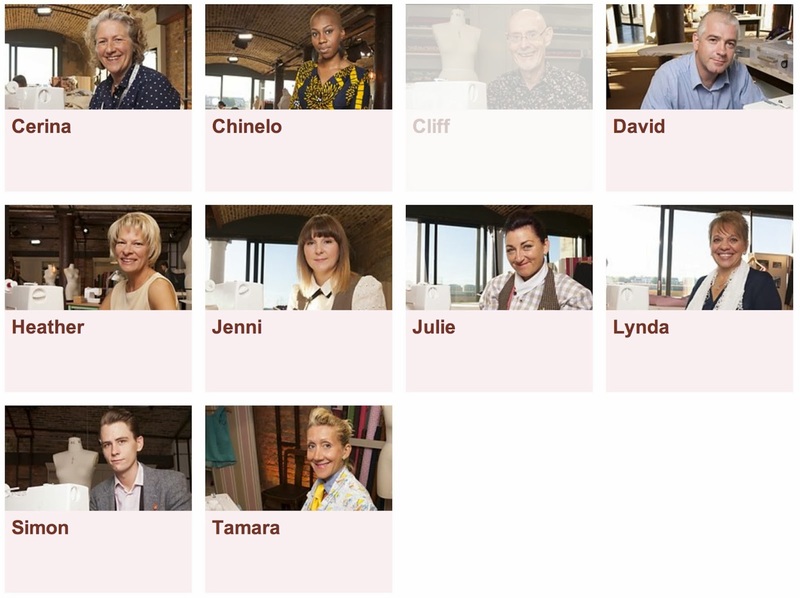 Loving the sewing Bee, like to hear what other people think of the show, will be back to follow along. Hope to have a go at making a top this weekend...the show has got me all inspired . I'm feeling really inspired to get back behind my sewing machine too.